Chris Guillebeau in his new book, The Art of Non-Conformity, talks about the idea of abundance vs. scarcity. He encourages us to have a lifestyle and a mentality that focuses on abundance instead of scarcity. So I created a little bit of a comparison, an either-or. It’s about thinking with abundance or thinking with scarcity. So here they are. You share with as many people as you can – how you became or how you found success, either with a specific product, or with your overall business. You share your road map to success. You keep your track to success to yourself. You have a bent towards sharing. You have a bent towards hoarding everything. Finds win-win situations all the time. There’s always a winner, and there’s always a loser in the same transaction. You celebrate everyone. Even your competition. You’re jealous of successful people, especially your peers. You assume success for yourself and you hope success for others. You have a great fear of failure and that is what you think and focus on. You ignore your competition emotionally. You don’t let their successes bring you down. You focus on your competition emotionally. You focus on their successes and you worry about their potential. Because again, there are always winners and losers. You think of ways to help others. You calculate and measure every relationship for what it will bring you. You assume people will help. You assume people will lie. There are no-questions-asked refunds, like Bed, Bath and Beyond. You have a very, very strict return policy. You compete on value – the value you provide. It’s always about cost. You over-deliver, unintentionally very often. It’s all about minimums, one refill, that’s a good example of scarcity. You’re willing to lose money on the short-term to earn trust on the long-term. You ignore trust, and you end up losing money in the long run. Trust isn’t even part of the equation. 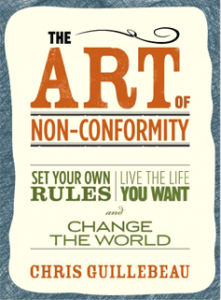 In his book The Art of Non-Conformity, Chris talks about how he wrote this this manifesto. It has been downloaded, at this point, over a 100,000 times. He also wrote a thesis that’s been read by 3 people and approved. The cost of the manifesto was very low. It’s a PDF document. The cost of his other document (the thesis) was much higher, it required many years of education. The time was about equal between the two when it came to actually writing the documents. But the return on the manifesto, was abundant. He gained relationships. He gained trust. He gained a name for himself. Most important, I believe, he changed many people’s lives writing that document. Now, with the other document (the thesis) the return was minimal and that he got very little feedback compared to the manifesto. Not that many relationships were created or deepened through the writing of the thesis. Very few people read it. It didn’t have that much of an impact. And as he talks about in his book the Art of Non-Conformity, he could’ve expanded the thesis to other sources but even then it would be much more of a trade journal and wouldn’t be sort of for-the-masses, like his manifesto was. So my encouragement to you is try to focus on and find ways to live a life of abundance in your business. Of course if you’re going to do it in your business, you should do it in your personal life as well. But remember, in scarcity, and in that mentality, there are winners and losers. That means, there’s a 50% chance you might be a loser. And the mentality of those who think with abundance, there are only winners. So which one do you want to be? You get to choose.